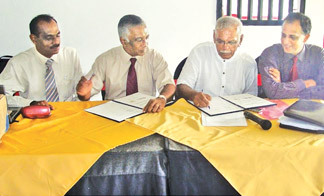 The Business for Peace Alliance (BPA) and the Ceylon Chamber of Commerce (CCC) signed a Memorandum of Understanding (MoU) on December 11, with the aim of strengthening the regional network and sharing its services with membership in the regions. The signing ceremony took place at the Annual General Meeting of the BPA in Kandy. (From left) - BPA vice chairman Fathaulla - CCC CEO and secretary general Harin Malwatte, BPA chairman K.C Suwaneraj and BPA vice chairman Chamly Gunaseela. The Business for Peace Alliance or "BPA" as it is popularly known is a network of regional business chambers throughout Sri Lanka. BPA's current membership stands at 26 chambers that bring together approximately 15,000 Small and Medium Enterprises (SMEs). The BPA has been able to come together to play the role of "voice of the regions" and has identified a number of well thought out initiatives to strengthen the regional chambers to play a more effective role supporting their members needs. BPA President K.C. Suwanneraj said that the strength of the Ceylon Chamber of Commerce and its wide network will an asset to their movement. As a first step in taking forward this MoU, the BPA Secretariat will operate from the CCC Secretariat and the two organizations will work together to offer better coordinated services to Regional Chambers. The Ceylon Chamber of Commerce CEO and Secretary General Harin Malwatte mentioned that CCC is concentrating on strengthening regional businesses by empowering the regional chambers and enabling them to provide a better service to the regional businesses. CCC will assist BPA by taking on the responsibility of coordinating the network. With a strong regional chamber membership with as many as 20 regional chambers, CCC will definitely add value to this MoU. The CCC apprised the members of the BPA of the wide range of services that can be accessed through the CCC for business development and invited the BPA members to make full use of the CCC services.